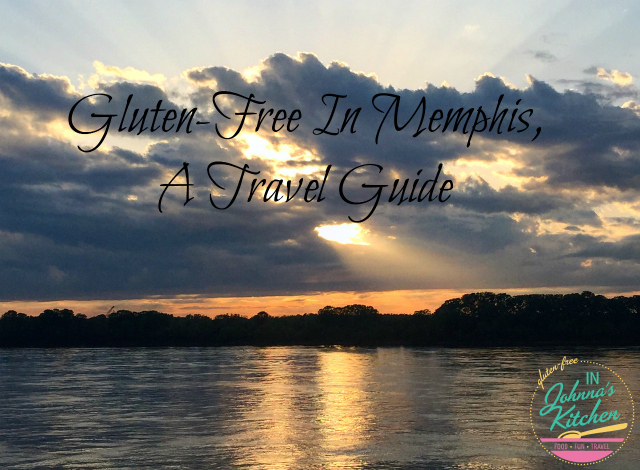 Gluten-Free in Memphis is exceptionally delicious AND relatively easy to locate. Below you’ll find information on all of the spots where I have personally dined in Memphis plus I’ve included a few tips on points of interest I think you’ll enjoy visiting. 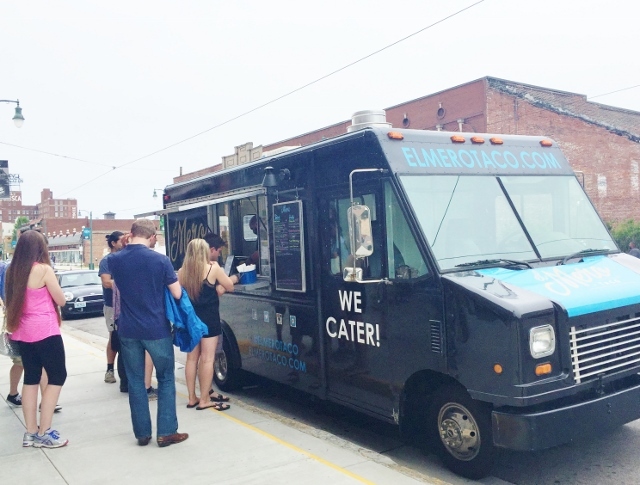 Let’s get started with where to eat! Favorite Brunch: The Beauty Shop. Located in the Cooper-Young neighborhood, this fun spot is housed in a 1960’s beauty parlor turned eatery and bar. Make a reservation if going for weekend brunch, maybe ask for one of the coveted seats beneath a hairdryer. Oh, and order the grits and a giant mimosa! Favorite Grab-and-Go: Raw Girls. Grabbing a quick meal to go while traveling doesn’t often equate to healthy eats. But is does in Memphis! 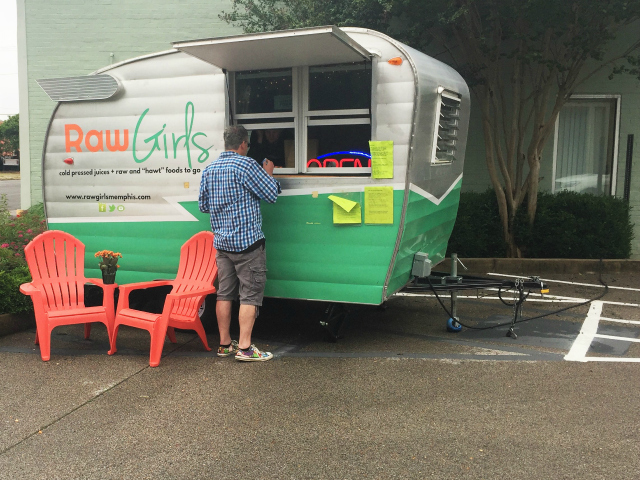 Raw Girls has two locations, one in a vintage trailer in Midtown and another on Poplar Road. Grab a salad, a raw entree, a juice or two and you’ll be all set for the times when you are sightseeing and don’t want to sit down for a lengthy meal. Pro tip: pack a small cooler like this in your suitcase then fill it with great eats from Raw Girls until you can get back to your hotel. Stick the great goodies in your hotel room mini fridge so you are never far from a safe meal while visiting Memphis or have a late night snack after a long night on Beale Street. 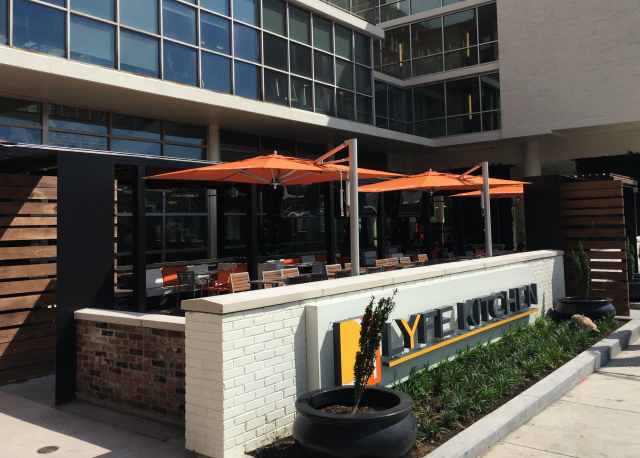 Favorite Eats near Beale Street: LYFE Kitchen. A quick walk from Beale Street delivers you to LYFE Kitchen. A menu packed full of tasty meals, starters, even a few desserts that are perfectly-sized. It’s also a welcoming environment, nice for taking a break from sightseeing. If the weather permits, ask for a patio table. Favorite Historic Venue for a Restaurant: FUEL. 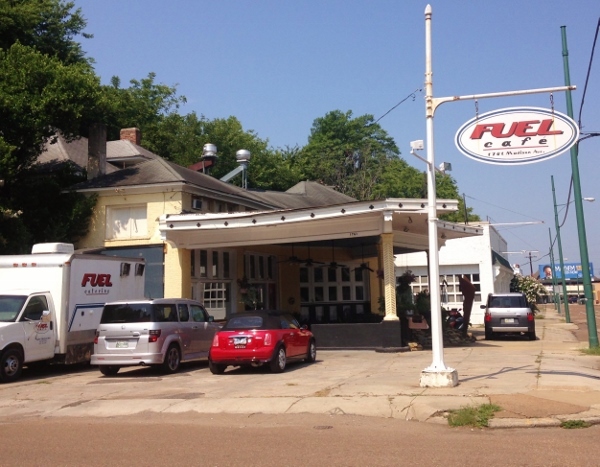 FUEL is located in a 1920’s gas station in Midtown Memphis. Great location, great staff and terrific food. I had brunch here, which is no longer offered unless you consider early lunch on Saturday as brunch. 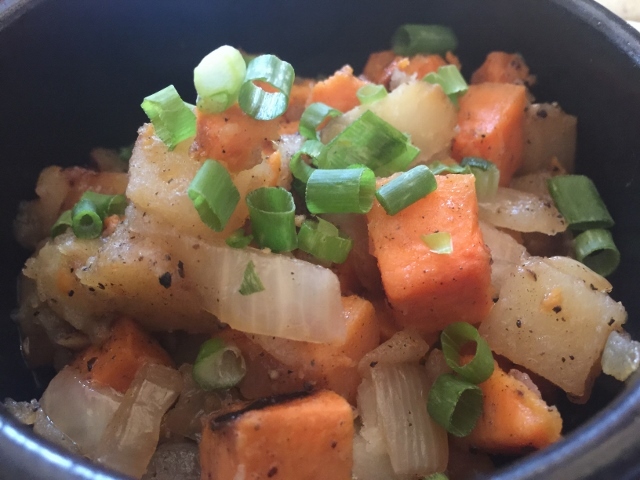 (Plus there’s a great recommendation above for Sunday brunch…) The menu has many gluten-free offerings marked, but if you see something and think it might work for you, just ask. Super nice people who want to feed you! 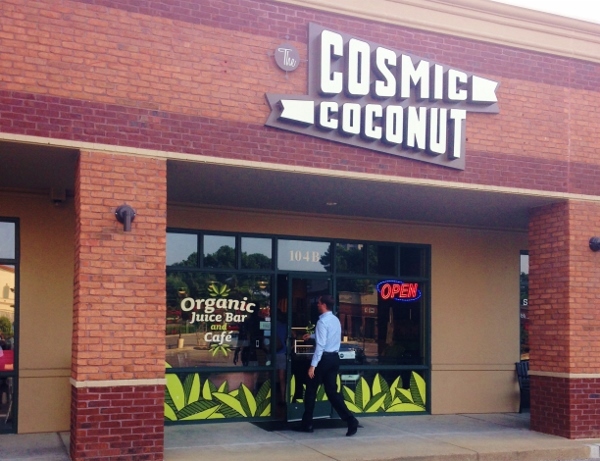 Favorite Suburban Strip Mall Surprise: Cosmic Coconut. This is the perfect spot to grab a juice, a smoothie, an acai bowl or a salad. It’s worth the trip to East Memphis to grab a few eats and a juice here. 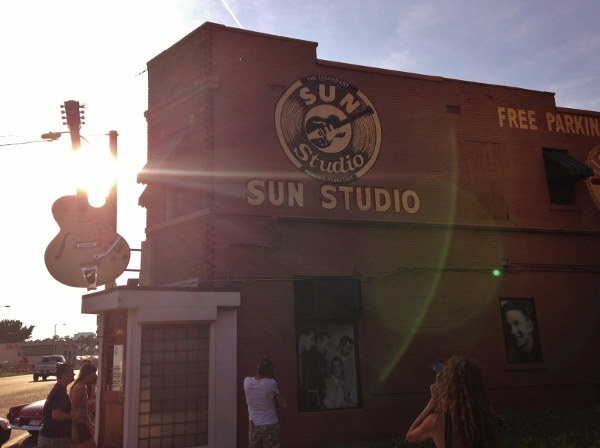 Sun Studio: Sun Studio is considered the birthplace of rock-and-roll. Spring for the tour, it’s worth the price. Musicians including Elvis, Johnny Cash, Roy Orbison, Jerry Lee Lewis, U2, Bonnie Raitt and Ringo Starr have recorded here. The tour takes you through the history of Sun Studio, including a look at some of the original recording equipment and concludes in the studio where you can play the drums U2’s Larry Mullen Jr. recorded on here. There’s a nice gift shop and counter where you can grab a coffee or retro soda before or after the tour. Stax: I mentioned Sun first and everyone goes to Sun. 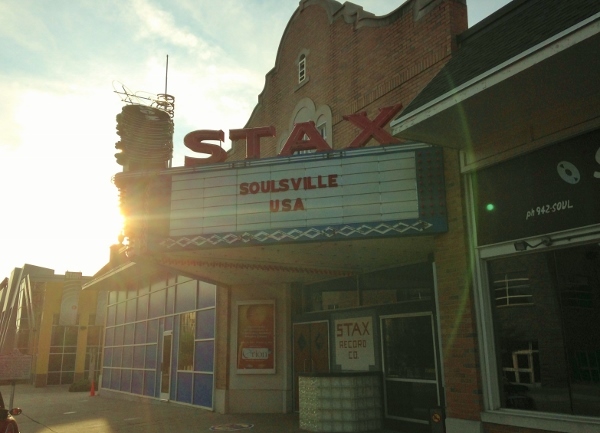 But somehow many seem to overlook Stax, which is the home of American Soul Music. Greats like Otis Redding, The Staple Singers, Booker T. & the MGs have recorded here and great musicians continue to work with Stax, including a current favorite of mine, Nathaniel Ratelife and The Night Sweats. The museum is polished and a true delight to visit. Adjacent is the Stax Music Academy where primarily at-risk youth are mentored through music education and unique performance opportunities. And of course, a terrific gift shop. I like to browse the vinyl records here, my favorite fella has snagged fun t-shirts when we’ve visited. Graceland: Sure, it’s stereotypical to visit Elvis Presley’s home Graceland when you are in Memphis. It’s also well worth the trip. You’ll purchase a ticket across the street at the complex of many shops and eateries, then take a bus ride across the street where you’ll be dropped off at the front door. The tour is a self-guided audio tour and you’ll have plenty of time to really look around. You might even catch an Elvis Super Fan shedding a tear or two along the way. It’s fascinating to see what a rock star’s home looked like in Elvis’ day compared to what it looks like today. National Civil Rights Museum: Put this first on your list, above Graceland, above Sun and Stax. Allow at least a couple of hours to really take it all in. 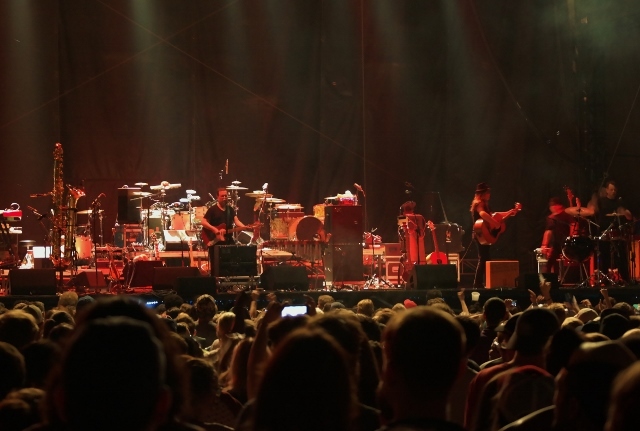 Memphis in May and Beale Street Music Festival: a month long festival celebrating all that is Memphis from music to BBQ. You can read about my visit to the Beale Street Music Festival and start planning your visit now. 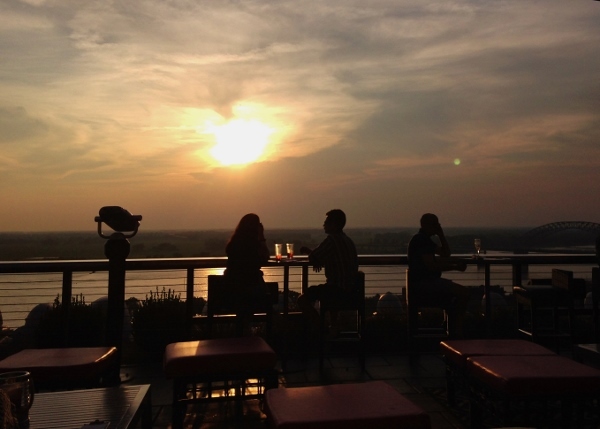 Best Place to Catch a Sunset: Twilight Sky Terrace, a rooftop bar atop the Madison Hotel. You don’t need to be a hotel guest to have a drink here and take in the gorgeous sunset views over the river. 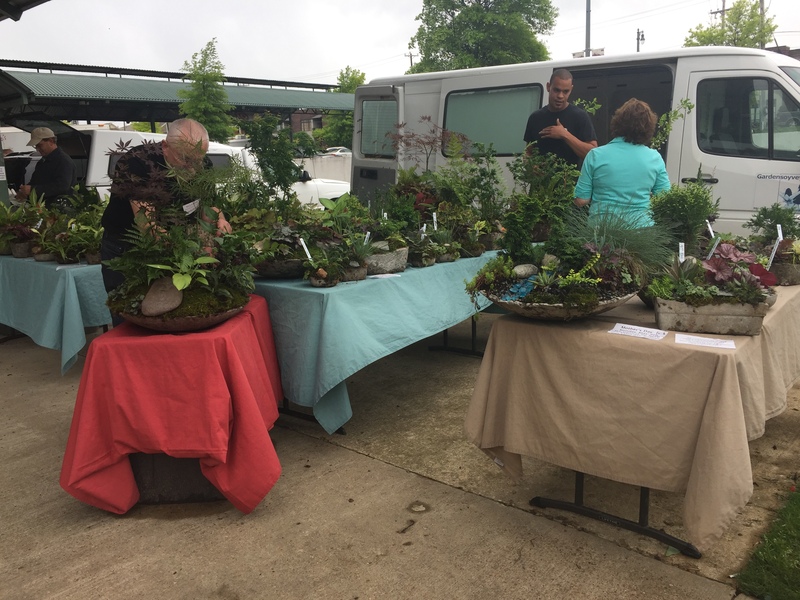 Memphis Farmers Market: From April to mid-November, 75 farmers from the Memphis area sell flowers, plants, herbs, meats, eggs, dairy products, baked goods and prepared foods. There are also kitchen and garden focused artisans selling products made locally. It’s always fun to see what farmers grow that is different from your area, plus you’ll surely snag a few souvenirs to take home. On our recent visit, I bought goat’s milk soap for our housesitters and spent a good bit of time admiring these hypertufa gardens. You’ll also hear live music at this market located in the historic South Main District of Downtown Memphis. 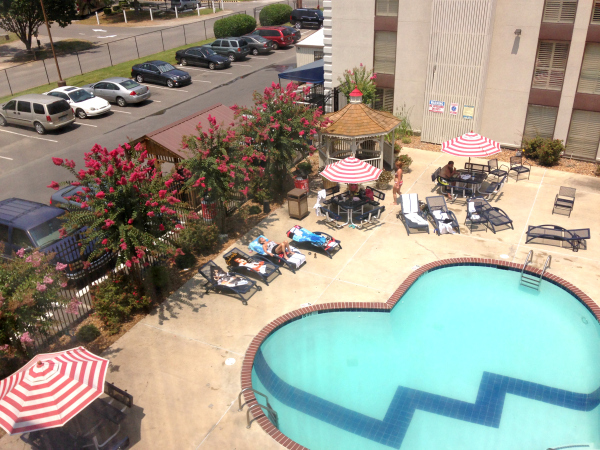 Where to Stay: Memphis is incredibly easy to navigate, so while staying close to Beale Street or other sites that interest you may appeal, staying anywhere in the city makes it pretty easy to get to where you are going if you have a car. 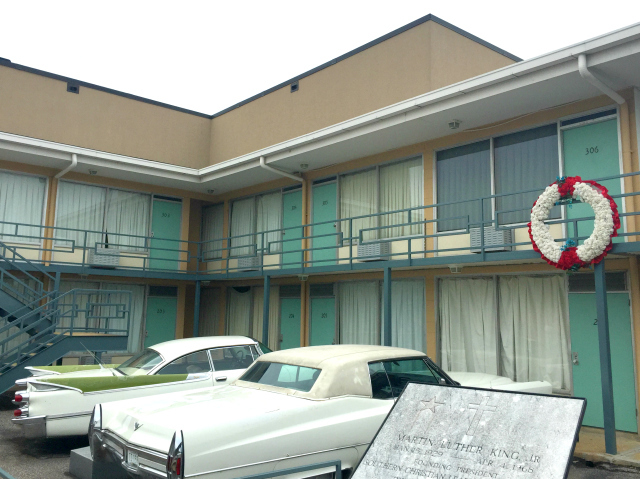 We stayed at Elvis’ Heartbreak Hotel on one visit. Yes, it’s absolutely cheesy, campy and over the top, down to the fuzzy fur-covered phone in the lobby. It was also really fun, close to Graceland and our room was very nice. We didn’t stay in one of the themed suites, just a regular room, and really enjoyed our stay. We got a package that included VIP tickets to Graceland, which allowed us to bypass the line, and also included parking at the hotel which was a nice bonus once we saw the extensive parking lots for non-hotel guests. 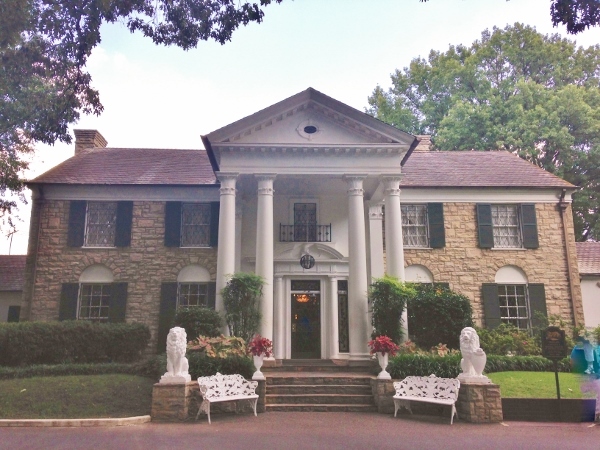 There’s not much in the immediate area around Graceland, so we would probably choose to stay in another area of town rather than stay here again, but it was sure fun to experience total Elvis-immersion once. On another visit, we stayed at a basic chain hotel out in the suburbs. As with everywhere we have been in Memphis, the staff were very kind. The room was simple, the hotel close to the highway. It made it easy to get wherever we wanted to go in town. Both of our recent visits to Memphis have been during events that caused hotels downtown to fill up quickly. On our next visit, I’d love to stay at The Peabody. We’ve stayed at a Peabody hotel in another city and enjoyed the service, historic setting and of course, the Duck March. I hope you’ll find these dining recommendations and travel tips handy when planning your visit to Memphis. It’s such a great city with friendly people. I can’t wait to go back! Ready to visit Memphis now? I sure hope so. Once you’ve been, I would love to hear all of your travel tips.